LAHORE: Increasingly under pressure in his country over the continuing drone attacks by US agencies in Pakistani areas, Prime Minister Nawaz Sharif made a strong plea over the weekend for speedily resuming peace ties with India. "We must aim to dismantle visa requirement between the two countries," Sharif said choosing the unusual venue of the opening of a literary and cultural conference to voice the demand. The reason: he was told that The Times of India's correspondent was present at the function. Directly addressing TOI's representative for a large part of his speech, Nawaz Sharif said: "You must go back and convince your government to sit with us and resolve issues." He added: "I understand that your country is going to elections so the anti-Pakistani bogey is being raised. But let me tell you in the run up to the last election we never raised an anti-India bogey." 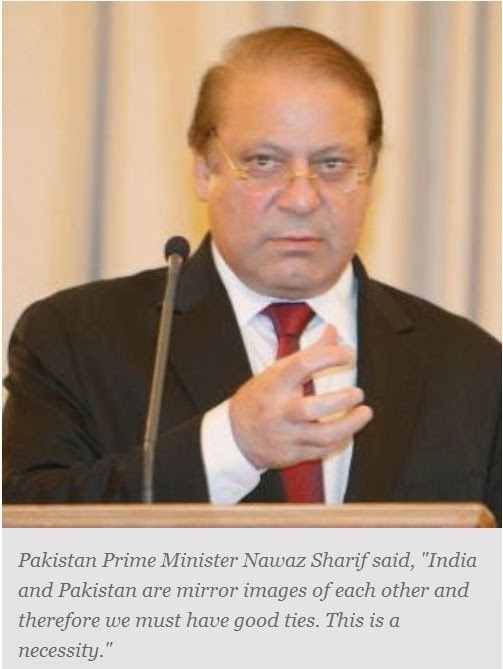 "India and Pakistan are mirror images of each other and therefore we must have good ties. This is a necessity," he stressed. His plea to an Indian journalist surprised the audience - most of them writers and men of letters - and many wondered why he was doing so at a meeting to discuss the future of Urdu. A drone attack on Hungoo, a big city in the border province of Khyber-Pakhtunkhwa has stepped up pressure on Nawaz Sharif. This is not the first US drone attack but is the first such strike in a 'settled' area. The attacks - targeted at the Taliban - have, however, incensed the entire nation. Imran Khan's opposition Pakistan Tehreek-i- Insaaf party has been organising countrywide demonstrations and threatening to block NATO supply routes to Afganistan that pass through Pakistan. Other leaders have said that it is time the nation took a call whether they want dollars or have their sovereignty compromised. Sharif said that Pakistan's priority under his regime would be to revive the economy and check terrorism. Not a day passes in Pakistan without terrorist attacks in some city or the other. "This is causing a lot of anxiety in the country and the US has replaced India as enemy number one. We now feel the need to build excellent relations with India," said a senior civil servant. Analysts said that Sharif hailing from a business family is also looking for more exports to India and feels the need to normalise ties. But he has not been able to bite the bullet and grant MFN status to India. Though Sharif wants visa requirements between two countries to be dismantled, presently the visa regime is very restrictive. Those over 65 are however allowed visa on arrival. This facility has recently been introduced but not much used.